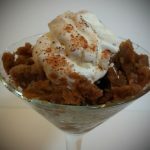 I love chocolate inspired cocktails and I love café con leche, so what better way to start your Mother’s Day brunch with a decadent yet refreshing granita. A granita’s consistency is somewhere between a sorbet and a sno-cone and what’s even better is you don’t need any special tools to make them. Prepare your favorite coffee, dissolve the sugar and vanilla in the coffee and mix in 1 cup of your liqueur. Pour the mixture in a dish that is low and wide and place it in your freezer. After about an hour with a fork, scrape the edges and place back in the freezer. An hour later repeat step 2 and continue the process till you have a sno-cone like consistency. While you’re waiting on your granita to fully freeze you can prepare your ‘leche’ topping. Whip the heavy whipping cream until it forms peaks while slowly adding the remaining chocolate liqueur. Place your martini glasses in the freezer till their nice and frosted. Scoop out the granita and top with your ‘leche’ whip cream. You can garnish the cream with a dash of chocolate powder. Kid-friendly Version: Substitute coffee for hot chocolate mix (prepare hot chocolate with water not milk) and omit liqueur. Drizzle chocolate syrup over the whipped cream topping.